Most of the WordPress Theme Designers are typically not interested in the business aspect of selling their themes, after all, they are designers and not marketers. I know WordPress Theme Designing can be a full-time job and perhaps most importantly, you’re able to do what you love for a living! What’s better than that? If you fall into this category, than you should focus exclusively on designing and leave the specifics of payments, promotion and downloading up to a 3rd party marketplace. A highly popular marketplace that comes to mind is ThemeForest. You may have seen on this forum that we recommend themes from this marketplace because the marketplace is that good and we stand by them always. They really know how to please their customers and sellers without killing anyone in the process. I have bought several items from them for other blogs of mine so I am still a happy spender on there. Perhaps someday I’ll end up purchasing something that you are selling. Anything is possible as I am on their browsing around in my free time for the latest stuff. Although I have not listed a product yet, this is the most popular place to buy wordpress themes. The more marketplace you list your theme, the more chances at earning revenue on multiple websites. Authors have a lot of good stuff to take advantage of. I have not put a product yet on themeforest but in today’s world. Never say never. Please take a while to read all the documentation for the sellers to see if this marketplace works for your needs. 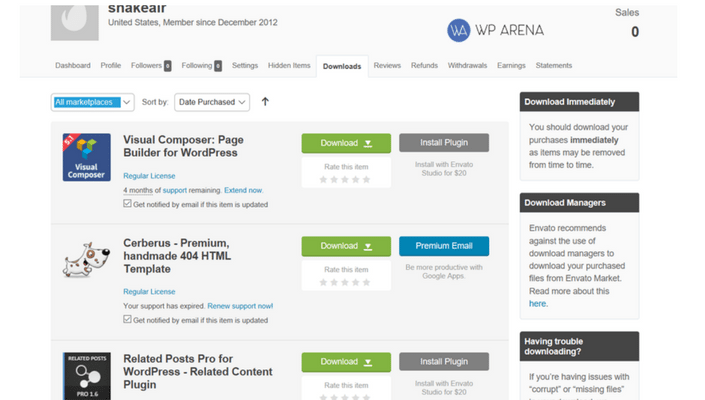 Have you used both of these marketplaces before to sell your WordPress themes? Kindly share a review of your experience for our readers below. Do you want one of our services that we provide? Is there any issue’s that you do not like as a seller but will continue to keep selling your work regardless? Previous Post How To Redirect The Spammers Where You Want To?